Some days ago I had another spike of desire to organize things. Which is typically fruitless attempt to use some todo (fails because of rigid rules) or mind map (fails because of mess) solution. todo.txt is staple name for a reason – plain text file, organized by you and to your taste, is about only thing that doesn’t drive you crazy. Or at least not too fast. But I just might have found something better for myself, because WorkFlowy web app manages to deliver all of plain text experience and more, without typical blunders. It is a little hard to come up with precise description for WorkFlowy. It brands itself as “organize your brain” tool, but seems to be mostly referred to as “todo list” type. Truth is – it’s neither mindmap or specialized todo list. I’d define it as list editor. The interface is single-screen and sheet of paper lookalike, while content itself is organized into giant nested list. You can focus on specific list branches (and quickly jump out via breadcrumb navigation) and fold/unfold them. You start with empty list, so it is completely up to you how to build and shape it. Any list item is effectively list root itself and you can add notes if you need it to keep additional text. words starting with # (tags) and @ (people) are turned into quick search links. The user interface experience is not just polished. It is probably one of the most convenient and snappy web apps I had ever tried. Even with minimalistic approach there are quite a few interface concepts, yet they become natural in seconds. Speed is strong focus, both for WorkFlowy itself and how you use it. There is extensive set of hotkeys and you can enable in setting optional on-screen cheat sheet for them. Any section of list can be shared for viewing or editing. You just get unique URL to send people and they can see or contribute to that specific part of list. They don’t need to register with WorkFlowy for either and changes they make are synced to you very fast. I encountered quite a few times annoying bug with last character in lines disappearing. Can’t reproduce it reliably and according to email reply from developers Opera is not officially supported (but works quite fine in practice). There is mobile version and I tried it for the sake of complete review. It kinda works, but isn’t as smooth as desktop web browser experience. My phone is probably closer to low-end of current Android standards, so your mileage may vary. At start I had constant “needs more features” thoughts, but really mindlessly stuffing it with features is more likely to spoil experience, than improve it. One aspect I am kinda concerned about is backup. I started with small list just-to-try and in couple of days WorkFlowy sucked inside all of my work and most of my life. It is very easy to get plain text copy of your list with export feature, but that is manual operation and I strongly believe that automation is essential for proper backup. Something like “email me my list every day/week” would be great to have. I don’t think WorkFlowy is quite whole-brain organizing thing, but it is exceptionally good way to organize things, that make sense as a list. It quickly becomes essential tool and being still in underknown/development phase… I really look forward to its future. There are number of reasons why I can’t seem to grasp who would ever use such unintuitive application such as Workflowy. I have made a list of things that can be added in order to make it useful, because at this point I see no reason for it. I use it and find it perfectly intuitive. There is nothing wrong with disliking some app, but don’t turn it into sweeping generalization. Good review of a great app, thanks! You are welcome. :) It’s a great find and easily becomes default thing for most notes and tasks. 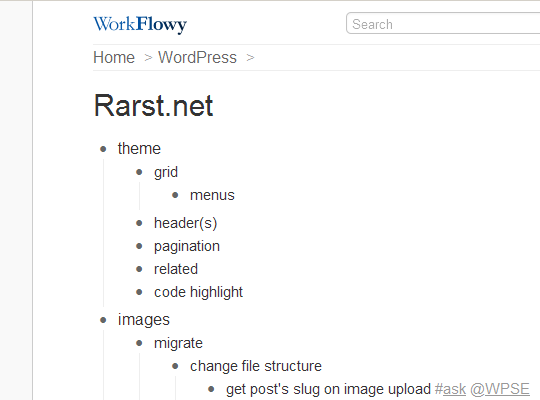 @Rarst – do you think a standard will emerge for todo.txt markup? I notice workflowy has an export format and there is a similar one from Gina Trapani’s Android app – todo.txt. We are building a todo.txt markup plugin for our team meeting actions app http://www.pailz.com but I’m not entirely sure which markup format will be become the standard and thus best to support. Or both? Any thoughts? Strictly speaking WorkFlowy is not marked up plain text. It exposes markup on export and has it internally, but for user it is rich text (that is just damn close to the plain text). Markdown works great for plain text markup… But markdown is really wrapper on top of HTML and describes how text looks, rather than adds structure and meaning for it. I don’t think there is such thing as generic todo.txt markup right now and I doubt it’s large enough segment of text editing to have own widely accepted format. Ok cool, thanks for the response!